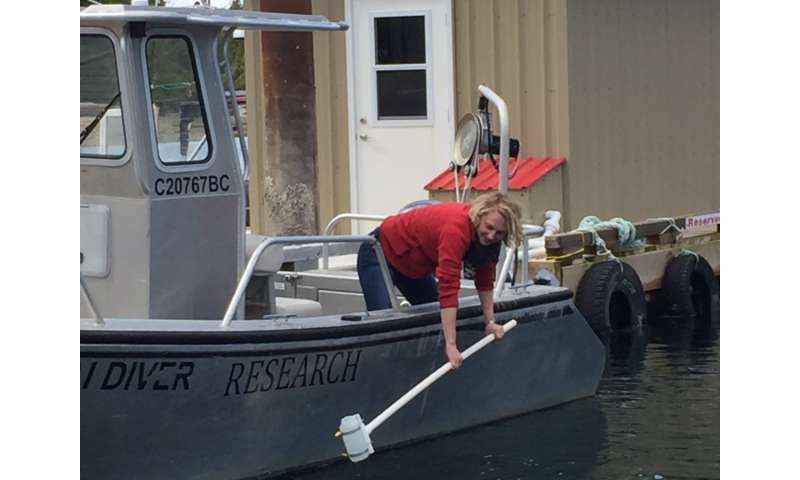 McGill University marine ecologist Jennifer Sunday is bringing cutting-edge DNA analysis to the formidable task of tracking ocean species along Canada's Pacific coast. As marine organisms move through the water, they leave behind tens of thousands of copies of their DNA every hour. Known as environmental DNA (eDNA), these signature molecules remain detectable for between one and seven days and have the potential to provide researchers with a vastly more detailed picture of ecological communities than conventional surveys reliant on catching individual organisms. Sunday is working to validate the reliability of eDNA-based techniques for tracking species' response to changes in their physical environment and in the ecological communities in which they live. "We know species are responding to climate change but we're not tracking it," Sunday says. "For ecology, for making better predictions, for responding to those changes and adapting our management systems, we need to be tracking what's changing. eDNA gives us the ability to detect species presence over time and space at a resolution that's never been possible before. That gives us the ability to detect range shifts but also to know what the natural variability is." Sunday has been working with the Hakai Institute in British Columbia to collect samples for eDNA analysis. The aim is to determine the level of sampling required to get an accurate picture of the species present in a given area. Over the 2018 summer, Sunday and her collaborators collected seawater from more than 150 locations off the shores of Calvert Island and Vancouver Island, covering areas with varying seafloor conditions at intervals ranging from 15 metres to 30 kilometres. With support from the McGill Sustainability Systems Initiative (MSSI) Ideas Fund, Sunday will now analyze the samples using metabarcoding, a technique that amplifies trace amounts of DNA present in the water. Variations on the technique can narrow the search to reveal only certain types of animal – fish, for instance – or widen it to include all living organisms other than bacteria. "With one sample we can detect hundreds of species. We can describe the community and watch how it changes," Sunday says. The data provided by eDNA metabarcoding can be combined with existing information about the ecological roles various species play to give researchers insight into how species are responding to changes not only in their physical environment but also in the makeup of their community. The relative simplicity of collecting water samples means there is strong potential to scale up eDNA sampling to cover entire coastlines. Sunday and her collaborators at the Hakai Institute are developing a sampling kit that will be easy for non-specialists to use. Sunday envisions a network of citizen scientists along the Pacific coast – a network that will enable local communities to play a role in monitoring the marine ecosystems that are important to them while greatly expanding the data available to researchers seeking to answer questions on national and transnational scales. "You've got all these outputs," Sunday says. "Fisheries, local communities who care about what's coming and going, Canada interested in how things are moving on our coastline and how that interacts with the US. And then you've got the ecology and questions about how species are limited by the environment and by biotic interactions."